It isn’t a first birthday until someone has cake all over his face. Or, in the case of some buzzkill friends of mine who WILL be named (Jay & Jenny), yogurt! I’m all for healthy eating (well, 86% for it at least), but on your birthday you deserve cake. Even if you are only 1-year-old. Witness my own son’s first birthday cupcake smoosh-a-thon. Yes, it does deserve a-thon because, as you may remember, he had a Charlie Brown party but I had already made the cupcakes expecting friends. So, we had plenty of monkey-faced cakes for him to chow down upon. If nothing else the birthday cake eating/smashing moment is a great one for posterity. Here are some other great images of youthful cake glee I discovered via google. Cake smashing is its own sub-genre on Pinterest. Here’s some great photography to enjoy! Of course there is now actually a trend to provide the birthday girl or boy with her or his own cake that they can use for finger food and face stuffing. That seems a little much for a kid who won’t remember the moment past their next nap. Nevertheless, you only turn one once. 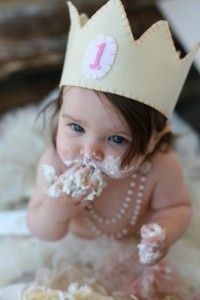 Let the baby eat cake! Share your own pics and thoughts in the comments below. I’d love to see them! The messier the better.